267 pages | 1 B/W Illus. Since 2011, with the British Government’s counter-radicalisation strategy, Prevent, non-violent Islamist groups have been considered a security risk for spreading a divisive ideology that can lead to radicalisation and violence. More recently, the Government has expressed concerns about their impact on social cohesion, entryism, and women’s rights. The key protagonists of non-violent Islamist ‘extremism’ allegedly include groups and individuals associated with the Muslim Brotherhood and Jama’at-i-Islami. They have been described as part of the ‘global Muslim Brotherhood’, but do they constitute a singular phenomenon, a social movement? This book shows that such groups and individuals do indeed comprise a movement in Britain, one dedicated to an Islamic ‘revival’. It shows how they are networked organisationally, bonded through ideological and cultural kinship, and united in a conflict of values with the British society and state. Using original interviews with prominent revivalist leaders, as well as primary sources, the book also shows how the movement is not so much ‘Islamist’ in aspiring for an Islamic state, but concerned with institutionalising an Islamic worldview and moral framework throughout society. The conflict between the Government and the global Muslim Brotherhood is apparent in a number of different fields, including education, governance, law, and counterterrorism. But this does not simply concern the direction of Government policy or the control of state institutions. It most fundamentally concerns the symbolic authority to legitimise a way of seeing, thinking and living. By assessing this multifaceted conflict, the book presents an exhaustive and up-to-date analysis of the political and cultural fault lines between Islamic revivalists and the British authorities. It will be useful for anyone studying Islam in the West, government counter-terrorism and counter-extremism policy, multiculturalism and social cohesion. 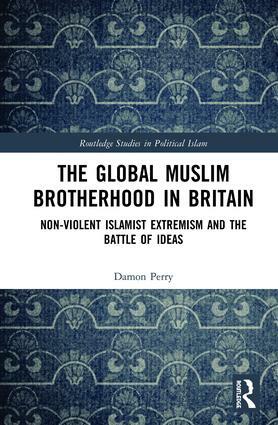 "In this important study, Damon L. Perry provides an insight-laden and up-to-date account of the Islamist movement that operates today in Britain. At a time when the British Government is thinking hard about how to deal with ‘non-violent extremism’, this book is valuable reading for policymakers and academics alike." Dr. Martyn Frampton, Reader of Modern History at Queen Mary University of London and the author of The Muslim Brotherhood and the West: A History of Enmity and Engagement. "This book provides a most comprehensive and nuanced analysis of ‘participationist’ Islamism in Britain associated with the Muslim Brotherhood and Jamaat-i-Islami. It is sharply observed, grounded in scholarship and will be of great use to anyone studying Islamism or working in counter-extremism, counterterrorism, or social policy." 1. Introducing the Global Muslim Brotherhood: Subversives or Reformists? Damon L. Perry, PhD, is an independent policy and security analyst specialising in violent and non-violent Islamist extremism.